The first known U.S. off leash dog park, where pooches can run without restraint, was said to be in Berkeley at the end of the 1970s. Now they can be spotted in urban and suburban environments, on any odd scrap of land. Usually governments or neighborhood associations act as the sponsor, but some are operated as private clubs. Often public park land is considered a prime candidate, but vacant lots could be a great choice too. 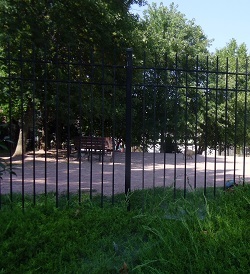 One suspects that in addition to providing exercise and fun for the canine set, these fenced facilities provide socializing opportunities and moments of respite from "walking the dog" for the humans as well. But as you might predict, even though most folks think that it is a nice amenity for the dogs, once a particular location is identified, controversy often begins. Neighbors are concerned about barking, noise in general, waste disposal, and vagrants hanging out there. Characteristics of a good site for an off leash dog park include sufficient land for the expected demand (an acre or more), existing shade, accessibility for disabled humans, isolation from residences or other places where people have a right to expect quiet, good drainage into a system where stormwater will be heavily diluted or filtered before reaching a stream, a place where a 6 foot fence will not seem out of place, a water source for both people and dogs, and already well-established grass if you plan to try to keep any grass at all. Many opt for some combination of sand, wood chips, and plentiful local materials as ground cover. On the latter point, a mudhole doesn't keep anyone happy for very long, and new turf won't stand up to running dogs. In all but the most walkable urban neighborhoods, the dog park needs parking nearby as well. If a local government wishes to establish an off leash dog park, it should set up rules of engagement well in advance. Doing so helps to manage expectations and may also keep opposition from becoming too boisterous. We are not saying that every proposed off leash dog park is a good thing. To the contrary, we've seen several that were ill advised and never quite fit in with the neighborhood. Thinking about some possible rules will lead to good dialogue about whether this park is genuinely needed and desirable. Occasionally one sees a separate large dog park, with an off leash dog park for smaller animals in another location. This may increase the congeniality of the experience, particularly if a large number of dog owners are concentrated in a small geographic area. Off leash dog park advocates can be a persistent crowd, but don't allow yourself to be bullied into doing something unwise. Consider carefully the land use conflicts, likely complaints from neighbors, adverse impacts on water quality, safe pedestrian access, potential for parking unless the location is a dense and walkable urban neighborhood, and the cost of maintaining the park. Probably you will need to ask the dog owners to kick in some financial support for the venture, unless your tax base is really flush. Many municipal dog parks are operated on the basis of a membership fee payable annually. Most of us with experience in urban neighborhoods recognize that often it is the most affluent neighborhoods that are the most interested in dog parks. So governments should beware of subsidizing higher income folks with their big dogs at the expense of those who struggle to pay their taxes. Figure out who will be responsible for maintenance and how much it will cost before spending a penny. Fences, grass or other surface, water fountains, benches, trees, and anything else in your off leash dog park eventually will need tending and even replacement. Exactly whose financial and logistical problem will that be? You may want to set up a committee or council of the users, so that you are not subjected to the vigorously expressed opinions of just one or two owners about what is actually happening in the facility. Of course, the committee might potentially become an advocacy group that demands more and more service too, so weigh the membership carefully. Try to appoint this group yourselves, rather than relying on the owners to self-select their representatives. It's important that the off leash dog park council keep the interests of the community as a whole in mind rather than becoming a fanatical interest group. If your town or city requires licensing of dogs (and if not, why is that exactly? ), your license records can tell you where you have a concentration of dogs and therefore of need. Balance the desire for an off leash dog park with other recreational and conservation uses of your parks, open space, and vacant lots. One advantage of the dog park is that it becomes a convenient way to distribute information about pet care, clinics, training, grooming, and so forth. Just make sure that you get paid if any of this information really constitutes advertising. But often veterinarians and other service providers are really dedicated to the good of the pet population, and can add value to the civic scene. The positive side of these facilities is that fun and socializing really does occur, greater exercise calms some dogs into better behavior behind their own fences, and there is potential for senior citizens or others who cannot care for a dog to enjoy others' pets. If your neighborhood enjoys dogs, and they seem to lack adequate place to rough-house in most private yards, the off leash dog park may be a happy solution. For urban neighborhoods who need to attract certain types of residents, the dog park actually can become a community development tool.